March 31, 2009 - The letter was penned in 1883, but it could have been written today. Its message is still very current. Its words still need to be repeated. "We Americans have yet to really learn our own antecedents," the letter noted. "Thus far, impressed by New-England writers and schoolmasters, we tacitly abandon ourselves to the notion that our United States have been fashioned from the British Islands only, and essentially form a second England only — which is a very great mistake." The city of Santa Fe, N.M., was celebrating the 333rd anniversary of its founding by Spanish explorers, and the invited keynote speaker would have to trek there all the way from New Jersey. And so the great American poet Walt Whitman wrote a letter explaining that prior commitments would preclude him from attending. Yet given the message in his letter, one can only imagine the amazing speech he could have delivered. And one can only wish his words still would resonate today. "To that composite American identity of the future Spanish character will supply some of the most needed parts," Whitman wrote. "No stock shows a grander historic retrospect — grander in religiousness and loyalty, or for patriotism, courage, decorum, gravity, and honor." While many European and American writers spent centuries demonizing the Spanish conquistadors and their Latino descendants — and sugarcoating the atrocities of other European settlers in the New World — there was one highly respected American poet who was a unique exception. "It is time to realize — for it is certainly true — that there will not be found any more cruelty, tyranny, superstition, &c., in the resumé of past Spanish history than in the corresponding resumé of Anglo-Norman history," Whitman wrote. Even before Spanish and Latin American historians began to complain about the centuries-old anti-Hispanic campaign, known as "The Black Legend," Whitman was writing about it. He didn't call it "The Black Legend." That name was coined by Spanish writer Julián Juderías in his 1914 book, "La Leyenda Negra y la Verdad Histórica (The Black Legend and the Historical Truth)." But in 1883, 31 years earlier, Whitman already had described it perfectly. He noted that "it is time to dismiss" the distortions of history "inherited from the English writers of the past 200 years." At a time when white Anglo-Saxon Americans had a very negative image of the Hispanic and Native Americans of the Southwest, Whitman took a courageous stand for not only Latinos but also Native Americans. "As to our aboriginal or Indian population — the Aztec in the South, and many a tribe in the North and West — I know it seems to be agreed that they must gradually dwindle as time rolls on, and in a few generations more leave only a reminiscence, a blank," Whitman wrote. "But I am not at all clear about that." He questioned how America could reject the only people who were "distinctively its own" while "cheerfully accepting and using all the contributions of foreign lands." Through his writings — especially the collection of poems he called "Leaves of Grass" — Whitman celebrated the life and culture of the United States. But in his willingness to recognize the country's diversity — and to be much more inclusive — he was way ahead of his time. In the late 19th century, Whitman was considered an idealistic champion of the common man. His words were often prophetic. And in the 21st century, at a time when prejudice against Latinos is still prevalent, prophetic he remains! 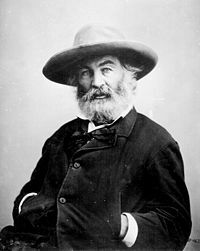 When he said that "we Americans have yet to really learn our own antecedents," Whitman was talking about those who still refer to Hispanics with disparaging terms, those who still commit hate crimes against Latinos, those who erroneously assume that most Latinos came here illegally, and those who are too misinformed to recognize and respect the complete ethnology of the United States. Published at Creators.com - Whitman's Prophetic Letter - on March 31, 2009.